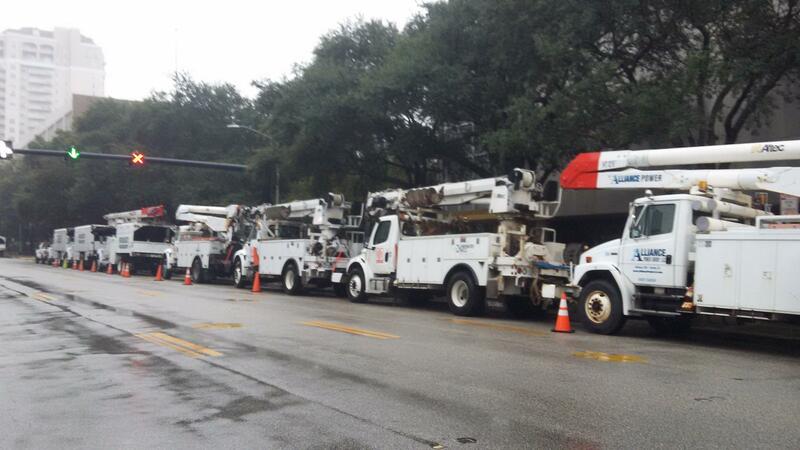 JEA trucks line up in preperation for Hurricane Matthew. There are 11 emergency shelters operating in Duval County, but Curry said if you’re not there already, don’t try to reach them. He said now is not the time to move. Curry said Jacksonville Fire Rescue Department is beginning damage assessment and search and rescue. Curry said tide gauge is now measuring 4.73 feet, which is the highest it’s been since 1898. The National Weather Service’s Angie Enyedi said the surge at Mayport “hasn’t been recorded in 100 years.” As of right now, JEA said about 193,000 customers without power and officials said that number will climb. She added expect storm surges to continue despite the eye of the storm moving east. The mayor will hold a briefing at 8 p.m., to update the public on safety during the storm and Matthew's path. Curry is also expected to hold another safety briefing at 6 a.m. Saturday while teams assess damage. Trinity Rescue Mission Homeless Shelter: Men's shelter at 622 W. Union street is full. Women's and children's shelter has a few vacancies. Men are being directed to City Rescue Mission's New Life Inn or La Villa Academy. City Rescue Mission: The mission will expand capacity of its regular homeless shelter to offer disaster shelter for those without homes. Check-in at the center on West State Street downtown will begin at 2:30 Thursday afternoon. It will remain open until the storm has passed. Salvation Army’s Towers Center of Hope at 900 W. Adams St.: The center will open its shelter as weather dictates and will remain open as long as needed. The Center of Hope information hotline is 904-356-8641. The shelter locations listed below will open at 6 a.m. Thursday. Mill Creek Elementary School, 3750 International Golf Pkwy. Osceola Elementary School, 1605 Osceola Elementary Pkwy. Bartram Trail High School, 7399 Longleaf Pine Pkwy. While shelters provide safety throughout the storm, residents must bring supplies in order to maintain personal comfort and sustenance. St. Johns County recommends that all evacuees bring their own bedding, including sleeping bags or air mattresses, pillows, sheets, and blankets. A three-day supply of water, non-perishable food, medication, diapers, and other personal items are also suggested. Please refer to the list below for additional supply suggestions and for more information, please call the St. Johns County Citizen Information Hotline at 904.824.5550 or visit www.sjcemergencymanagement.org/shetpub.html. Main Street Bridge: The Main Street Bridge in downtown Jacksonville is now open. Beaver Street from McDuff Ave. to Stockton St.: Two lanes open but significant construction. State Street: Eastbound lane (ramp to I-95 southbound) is closed – barrels, cones and barriers cannot be opened or altered due to excavation. I-10 at Cassat Ave.: Small local street Cassidy Rd. is closed allowing local traffic only. SR207 in St Johns County, Deep Creek: Bridge open one lane each direction due to significant drop off. Road Rangers: will offer 24-hour service to motorists who are stranded or are in need, and as an effort to keep the roadways clear for traffic. Road Ranger assistance can be requested by dialing *FHP (*347). The St. Johns River Ferry will be closed Friday. JAXPORT is one of four cruise ship ports closed in Florida due to Hurricane Matthew. Other closed ports include Port Canaveral, Port Miami, Port Ft. Lauderdale and Port of Charleston in South Carolina. No cruise ships were set to return Wednesday, but the two from Port Miami and one from Port Canaveral scheduled to return on Thursday are now scheduled to return on Friday. Cummer Museum: Due to the impending storm, the Cummer Museum will be closed Thursday and Friday. Updates on when the museum will re-open will be available on our Facebook page and website. Please stay safe and ensure your family is prepared for the storm as well. You can find a Hurricane Safety Checklist from the Red Cross here. The Jacksonville Landing: The Landing will be closed Thursday and Friday, and is expected to reopen Saturday, weather permitting. Riverside Arts Market: Riverside Arts Market has cancelled Saturday’s Filipino Pride Day and the market. RAM will return from 9 a.m to 4 p.m. Oct. 15 with Yoga Fest, featuring a full day of yoga classes. CareerSource Northeast Florida: First Coast CareerSource Northeast Florida will be closing beginning noon Thursday. Offices will re-open, conditions permitting, at 8 a.m. Monday. Jacksonville Zoo: The zoo will be closed Thursday and Friday. Currently, the Zoo will reopen Saturday, pending weather. Brew at the Zoo scheduled for Oct. 7 has been rescheduled for Nov. 11. Vendors and ticket holders will receive an email with further details. Downtown Vision: The outdoor festivities for the Oktoberfest celebration at Art Walk for Wednesday has been cancelled. Numerous business and organizations are still planning to be open. Visit iloveartwalk.com this afternoon for a list of businesses that will be open tonight. Ponte Vedra Concert Hall: The following performances have been postponed: Edwin McCain with special guest Danny Burns, Thursday; The Minneapolis Sound featuring Billy Buchanan – The Ultimate Prince Tribute, Friday; and Henry Rollins, Sunday. Garbage day: Friday garbage collection in Jacksonville will be picked up Saturday. Jacksonville Symphony: Two concerts have been rescheduled. The Symphony’s Coffee Concert Beethoven’s Fifth, scheduled for 11 a.m. Friday, in Robert E. Jacoby Hall will be moved to 11 a.m. Oct. 28. All tickets for the Oct. 7 concert will be honored. The Symphony’s free Community Concert scheduled for Jacksonville Beach’s SeaWalk Pavilion on Friday has been moved to 3 p.m. Oct. 30. Tickets are not required for this concert event. Duval Republican Party & all Victory offices: Campaign operations and all events will be shut down due to the storm. St. Augustine Greek Festival: The 19th annual event, originally scheduled for this weekend, has been postponed to the weekend of Oct. 28. TEACH: The TEACH Conference has been postponed for a future date in 2017. Clay County schools: All schools are canceled Thursday and Friday. The virtual planning day, which was scheduled for Friday, will take place Thursday instead. Baker County schools: Schools will be closed Friday. Macclenny Elementary will open as an Emergency Shelter 6 p.m.Thursday. Jacksonville University: In preparation for the potential effects of Hurricane Matthew in our area, all university activities beginning at 3 p.m.Wednesday through Sunday, including but not limited to classes, sporting events, admissions open house, and homecoming & family weekend. More information about campus preparations will be available throughout the day today in emails to our students, parents, faculty and staff. Jacksonville University is NOT mandating any evacuations from campus as JU residence halls are not currently in an evacuation zone. Jacksonville County Day: School and all activities are canceled Thursday and Friday. Parents who have conferences scheduled for Thursday or Friday will be contacted to reschedule once school operations resume. University of North Florida: The University of North Florida Crisis Management Team is cancelling all classes and student events after 3 p.m. Wednesday and cancelling all classes and student activities through Saturday. Classes and business operations are expected to return to normal Sunday. The campus will remain open throughout the storm. Edward Waters College: Campus is closed through Sunday. Duval County Schools: Duval County school officials announced just a few minutes ago that the entire district will be closed Thursday and Friday. That includes schools, after school activities, and extended day care. After school activities have been cancelled this afternoon as well…and school officials are encouraging parents to pick up their children as soon as school ends. Key school sites will be made available as shelters if the Duval County Emergency Operations Center requests it. Officials anticipate school operations and activities will return to normal Monday. Makeup weather days will be announced at a later date. Florida State College at Jacksonville: The college is closed at 3 p.m. Wednesday through Saturday. Included with these closures, the following events originally scheduled have been canceled and will be rescheduled at a later date. These include the JaxbyJax Sampler Event, originally scheduled for Friday; TEDxFSCJ: Engage, originally scheduled for Saturday; and the International Observe the Moon Night, originally scheduled for Saturday. Nassau County: All public schools and district offices in Nassau County will be closed Thursday and Friday. All school related activities through Saturday are also canceled. Only personnel involved with emergency preparedness and response are to report for duty. Episcopal School of Jacksonville: The school closes today at 4 p.m. All after school activities are also canceled. Grandparents' Day is canceled for Friday. In addition, the school and campus will be closed. After school activities and athletic events are canceled. The Varsity Football game is canceled. Mandarin High School Parade, originally scheduled for Friday, has been canceled.